This page covers the mainland parts, of the historic counties of Inverness and Argyll and the whole of Bute; including the Isle of Arran. 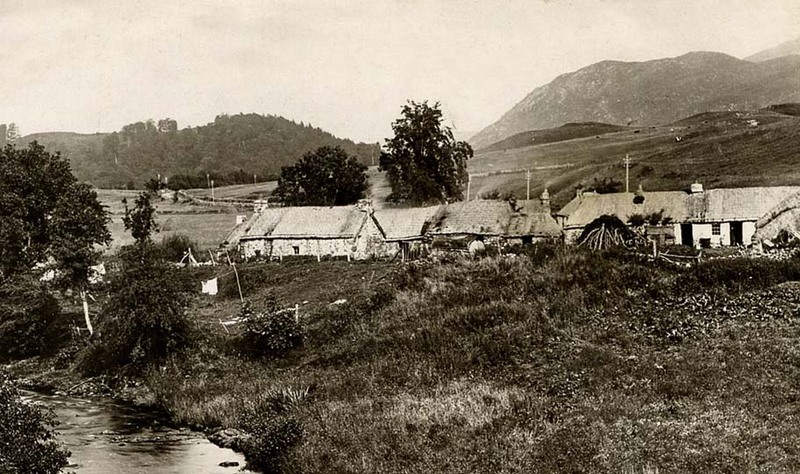 Most of this area follows the Highland tradition of thatching; but influences from other, nearby counties, are to be seen. Thus the Northern tradition is also present. Especially in the very north and in the south, of this large area. Sea side thatch… Overlooking the Moray Firth, at Ardensier. This cottage wears it’s age well, being around 300 years old. Now having a neat thatch of water reed, topped with a mortar ridge. Following the Northern tradition. 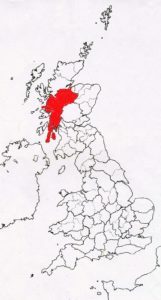 Much of Inverness- shire came under the influence of the improvements; and here the Northern tradition holds sway. Turf forming a base and a ridge, to most thatch. With heather, as well as straw, being used for standard coating. 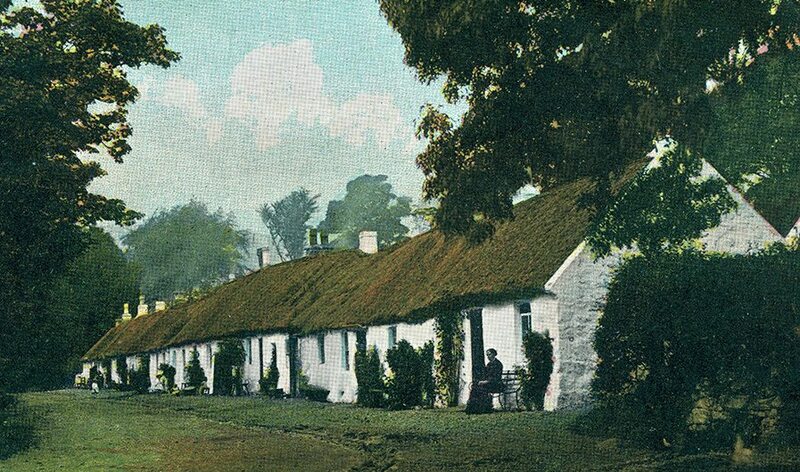 A probable, eighteenth century thatch, examined at Fort Augustus, seemed to follow this method. A good example of this type of work, can be seen on the battlefield, at Culloden. 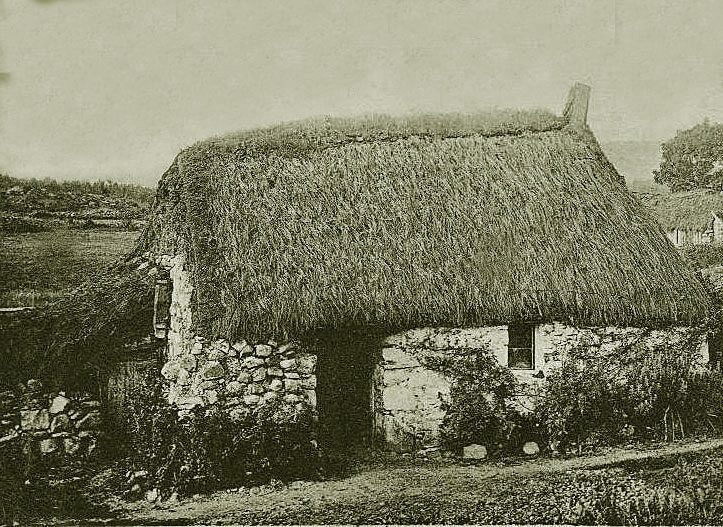 John Smith in his Agricultural Report of 1805, for Argyll, describes the thatching, on the homes of the ‘lower tenants’. Which, ‘commonly consists of straw sprots or rushes. 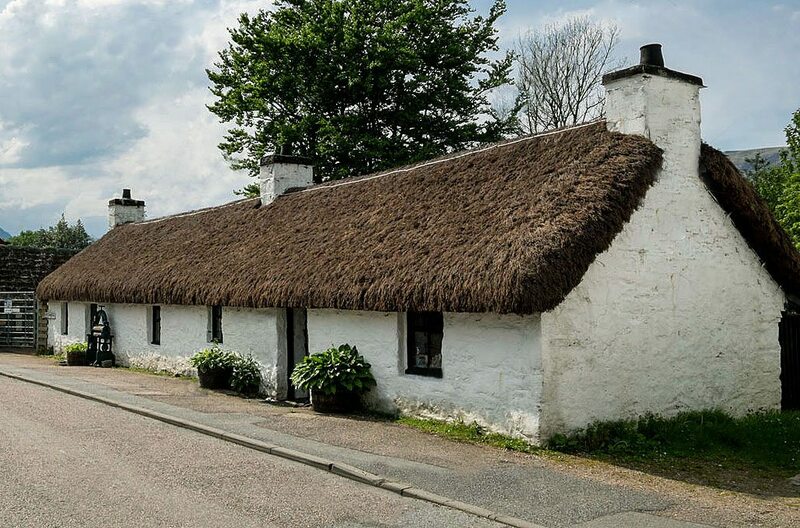 Is laid on loosely, and fastened of the same materials, or of heath; except in Kintyre, where the straw is fastened by driving the one end into the roof with a thatchers tool, as in the low country’. Mr Smith gives the life of a fern roof from 10 to 15 years. And was told the few heather roofs he found, lasted a century, ‘if well done’. The cost of a roof with ‘3 roods of heather’ (around 9 squares) was one pound sixteen shillings. 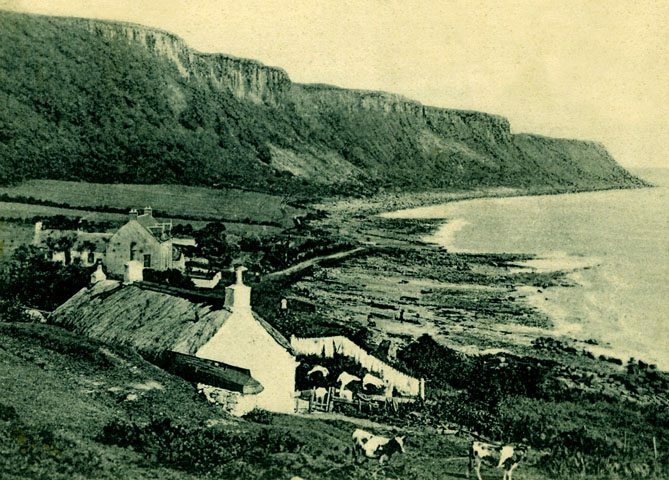 The stobbing, seen by Mr Smith in Kintyre was also reported in 1798. 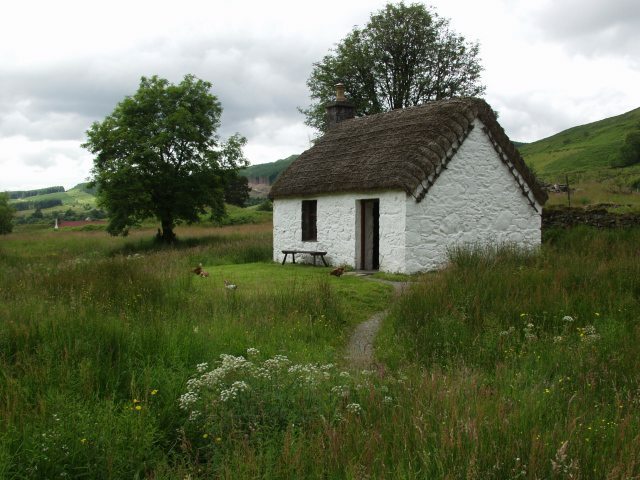 But in this report most thatch followed a directional Highland style. With a host of differing materials. In Bute this type of work was noted by Mr Aiton, in 1816. With an emphasis on heather, for both thatch and the weighted ropes. 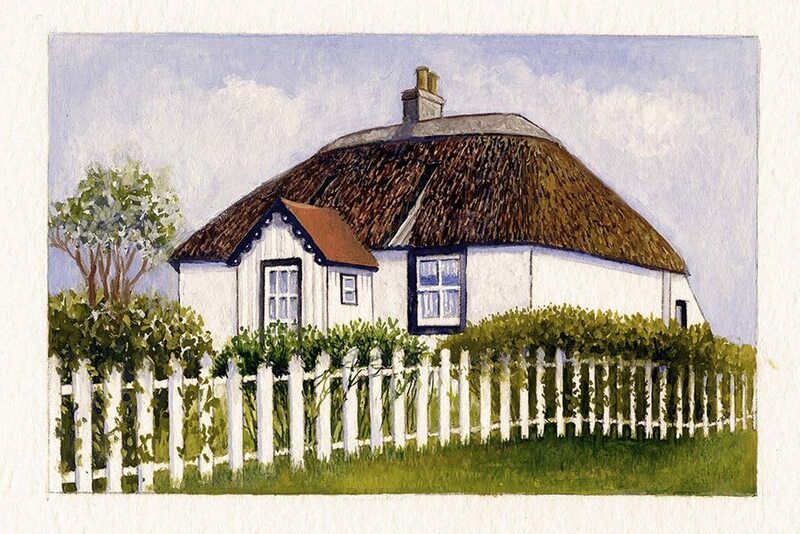 Stob Thatched…? 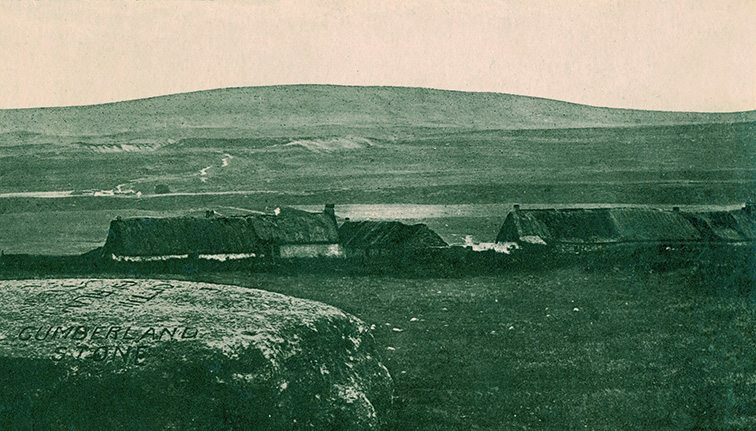 Very likely, at Fort Augustus around 1890; complete with a turf ridge. And a few timber outside fixings. The cottage below also belongs to this area and time. Thatched in heather and topped with turf. Both homes having wooden box chimney ‘lums’. Times past… At the Highland Folk Museum. 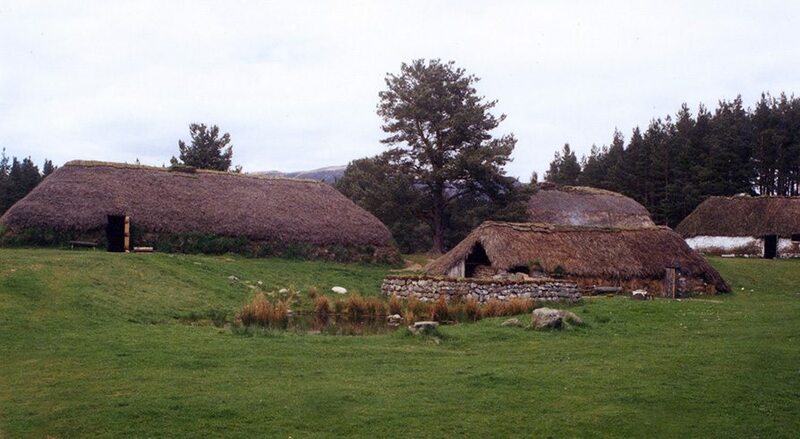 On this huge site, more than a few reconstructed thatches exist. Here are found, some of the ’lesser’ thatching materials. As described in the page on these. Often outperforming, the more commonly used ones. Photo; kind permission Highland Folk Museum. At Auchindrain, in Argyll. 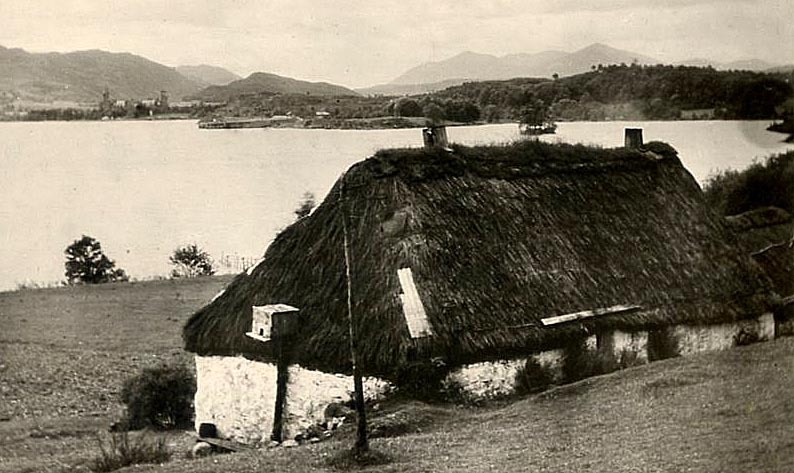 This original township, overlooking Loch Fyne; still has a little thatch. The modern roof, on the little surviving cottage, uses sparred rope, to augment some standard coatwork. Meanwhile, in 1900, in the north east of this area… Thatchers were covering the coatwork with clay. Following the methods, of nearby easterly counties. 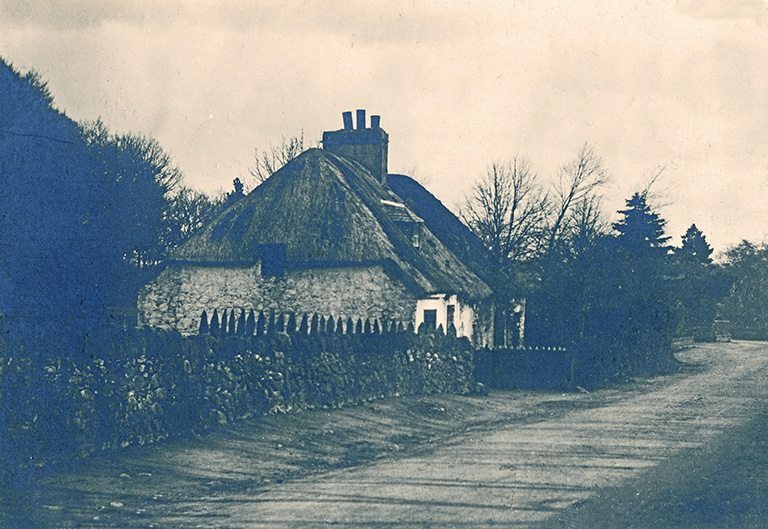 This faded image from Tomnahurich, near Inverness; shows a smooth covering on the thatch. While in the west of Inverness-shire… Highland methods were used. 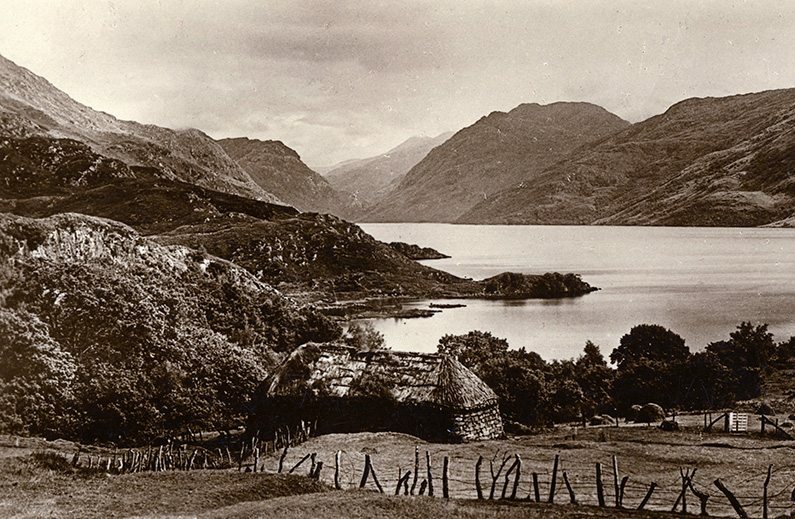 But no roping here, the nearby trees providing for a crook and caber finish, at the eastern end, of Loch Morar in around 1920. 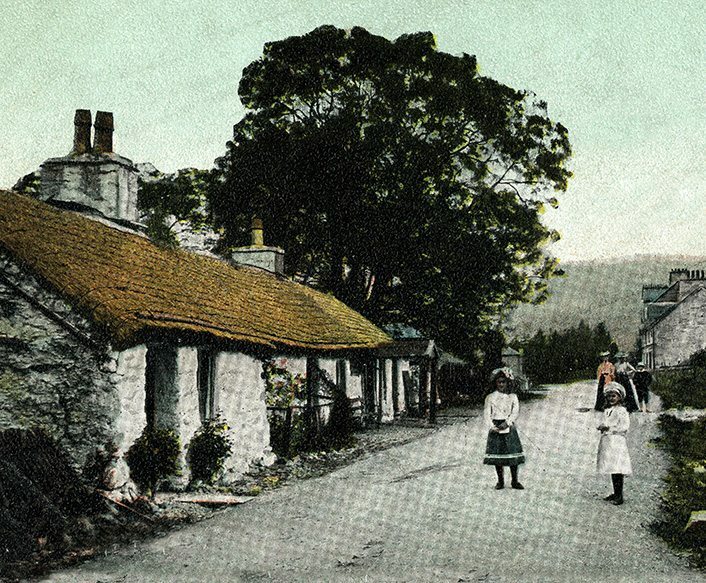 In Argyll, around 1900… Similar work. 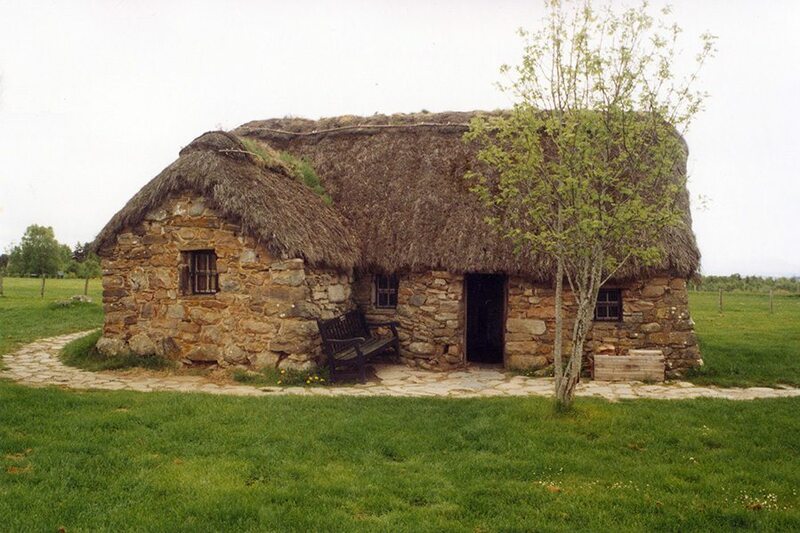 With directional thatch, held down with wooden fixings, holding rope or liggers in place. 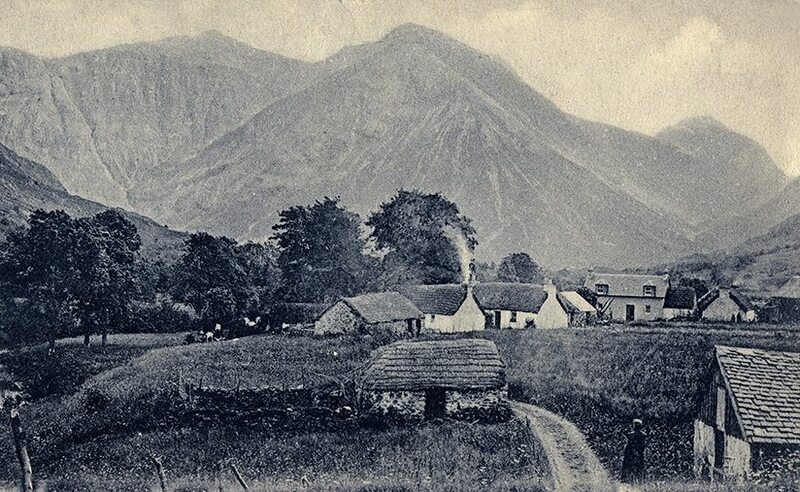 On the left at Loch Elive; and the right, at Glencoe. When the thatch was stripped here, a good many old firearms were found hidden within. Emphasising this place’s turbulent past. ‘In Glen Nant’… this glen in Argyll, is well known for its oak woods and former charcoal burning. 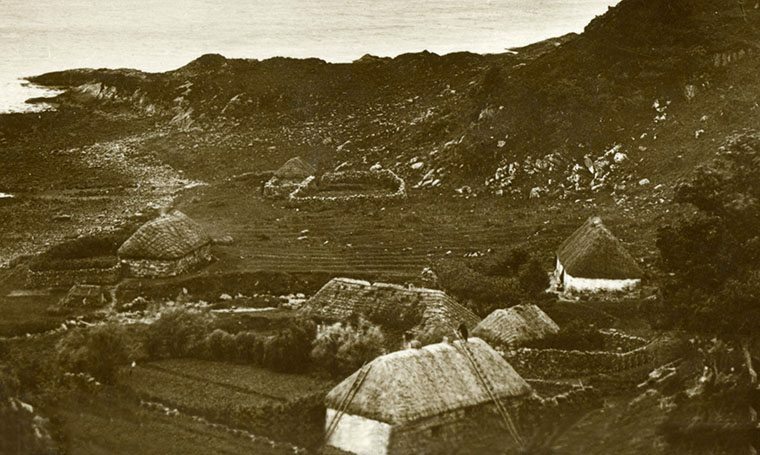 Every building, in this late Edwardian image is thatched, in a standard manner, with some outside wooden fixings.